To be or not to be. Well, it might be, and there’s the rub. Benedict Cumberbatch be praised, that rare thing a great actor with a star presence, beautifully lit. Reciting some of the most famous lines in theatre. One fluffed line in 1408 of them. What a stunning preview performance from him. The characters grow in the play, gaining their self-knowledge as we go along. Sometimes fast, sometimes slow. So it seems churlish to criticise as it gets to be so good later on. My comments come in the form of notes to the actors after the first preview night. 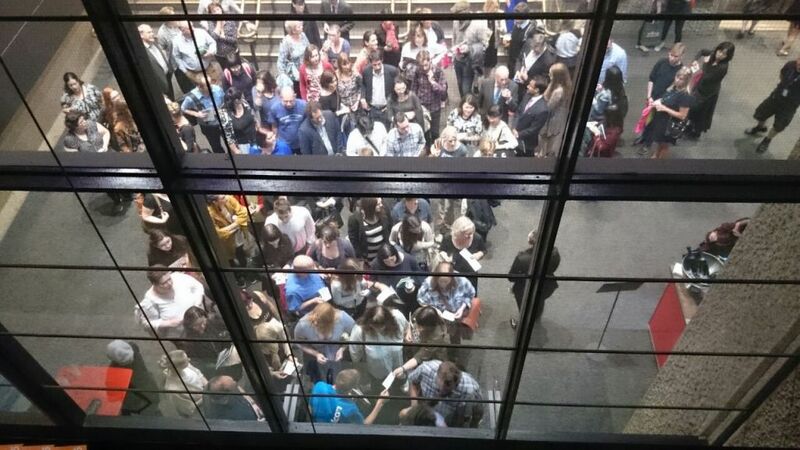 A packed, hushed, only one-hacking-cough, mostly Cumberfans audience at the Barbican Theatre, London. A younger, female demographic, no doubt driven by the pull of the great tragic play by the master of words, Shakespeare, and a still-rising star, Cumberbatch. A potent combination. The first act dragged but the second act was worth the price of the ticket – the fastest-selling play in British history. And it’s funny, and childish. The captivating poster by Shona Heath seems at first to be misleading, but it’s dressing up at soldiers, fancying a girl and having hissy fits with tragic consequences. In this production Hamlet is Nat King Cole’s “Nature Boy” – a very strange enchanted boy, who wandered very far and spoke of many things, of fools and kings. It’s sold out, so it’s a hit. 100 seats at £10, positioned throughout the auditorium, will also be available at each performance until 31st October 2015. No notes for Mr Cumberbatch. He nailed it. 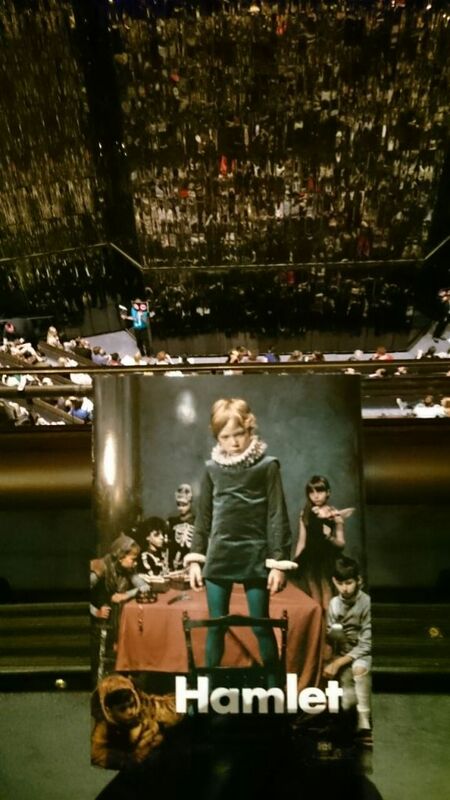 Benedict Cumberbatch (Hamlet), Kobna Holdbrook-Smith (Laertes) and the company of Hamlet at the Barbican. Photo by Johan Persson. This is stage, not TV to Game of Thrones actor Ciaran Hinds, for your first scene at least. It’s a huge moment when the curtain rises on the magnificent cavernous set. That amount of space eats your words when there’s no boom mic overhead. Anastasia Hille, as Gertrude, is a paler performance. She does Shakespeare’s vision of Ophelia justice in beautiful, painterly verse. A highlight of the show, her telling of the loss of Ophelia: “There is a willow grows aslant a brook” and in which I can see John Everett Millais’s portrait as she speaks. However, speech aside, it’s not what we see in Sian Brooke as Ophelia who brings a bit too much Mike Leigh with her cardies, but sings menacingly madly. Jim Norton as Polonius is fantastic and tragic if he hits his mark behind the curtain and of equal high ilk, Nigel Carrington as Cornelius. Kobna Holdbrook-Smith as Laertes commands the stage every time he appears and plays a mean tune on the piano. Leo Bill as Horatio bounds on with his backpack after the ghost to the tune of “Who you gonna call?, no. I made that bit up. But it is a bit surreal at times. Rudi Dharmalingam’s Guildenstern and Matthew Steer as Rosencrantz sort of work but you get distracted by their modern costumes and the thought they are almost in another play entirely. The ghost of Hamlet’s father, played by Karl Johnson is a City -suited flour-dipped apparition with a dodgy flickering light upon him. Might work on film but not in live theatre. Oh dear, what can I say about Sergo Vares’ Fortinbras, he had sympathetic accent and a handsome, red-lined coat. Special scene-stealing mentions should go to the boom-voiced Jan Shepherd as Courtier and the hilarious well-played clown grave digger by Karl Johnson (yes job swapping with the ghost) spouting subversive truths. The wedding banquet scenery steals the show until Hamlet rises, bathed in light, while around him everything is in filmic slow motion. It’s damn good as a theatrical device, once. Kudos to Sidi Larbi Cherkaoui who sort of pulls it off, save for some ridiculous hunting dogs and disco theatrics in the swash-buckling final gripping scene. Set design is stunning, by Es Devlin. It’s almost a show in itself, in both halves. The costumes and props are a bit perplexing – between two worlds, high baronial and camera-touting blogger. But there’s an inciting line with Hamlet crawling between earth and heaven. Perhaps that’s what was intended. Much to muse on for the hit-maker Sonia Friedman produced and Lyndsey Turner directed show. Lyndsey did the swaggering Posh – a tableaux of a riotous drinking club which left me thirsty for a more thrilling climax. And a desire to heavy hang ancestral portraits, with their appearance once again here. This had the climax and left me satisfied. A standing ovation and three bows. Wonder at Shakespeare’s voracity and hit show, running 400 years later but in a fresh and exciting way. If you can’t get a ticket, the play will be broadcast live from the Barbican stage in theatres on the 15th of October 2015, as part of the National Theatre Live initiative. You can watch encore screenings of the performance in Cinemas 1 and 3 on 20 and 27 Oct respectively. Opening night is 25 August 2015. Approx 3 hours/including one 20-min interval. Read more about Benedict Cumberbatch here – his catwalk show for London’s Menswear shows. P.S. for me, it’s three out of four – that’s not stars but Sherlock cast members seen on stage. 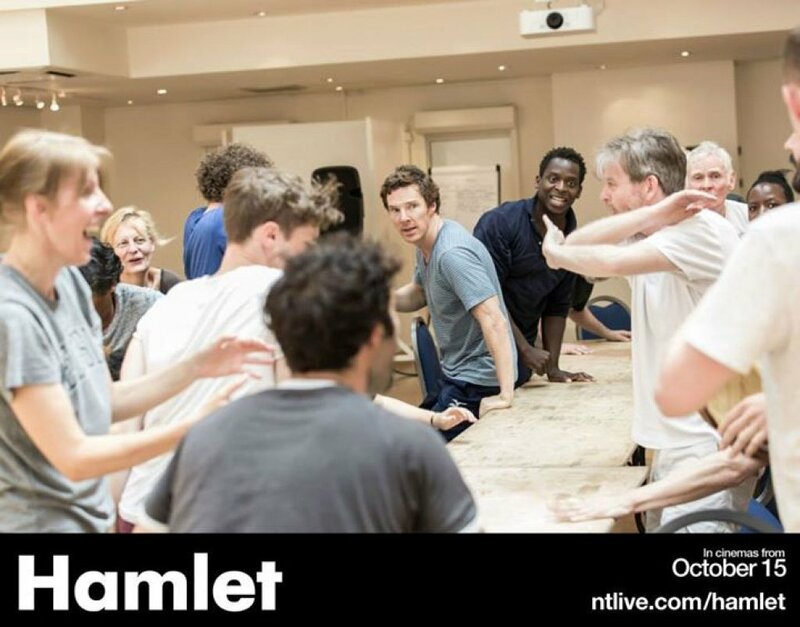 Andrew Scott (Moriarty) in the sensational Birdland at the Royal Court Theatre, Mark Gatiss (Mycroft) in the gruesome Coriolanus and now Benedict in this terrific show. There’s a lot for Martin Freeman to live up to, theatre-wise having deliberately missed him in Richard III.